Flat pack furniture is exactly what it sounds like: furniture that starts out entirely as sheets of wood, metal or even cardboard. 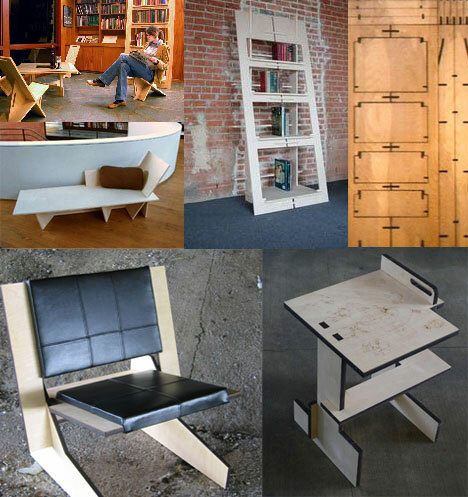 In addition to being clever and simply aesthetically awesome, flat pack furniture is also eco-friendly and highly creative. Without further ado, here are 20 more examples of incredibly compact and transforming flat-pack furniture for cramped urban living. Designer Keiji Ashizawa has applied flat-pack design principles in developing his sleek set of furniture objects including the above chairs and stools. Like giant versions of 3D toy puzzles or model cars, there is a playful aspect to these powerful industrial-produced sturdy-yet-elegant metal designs. RawStudio is the brainchild of Nick Rawcliffe, a talented designer with an impressive resume. He studied at the Bauhaus and Royal College of Art before moving to work in Japan. His furniture work is as eclectic as his background, which is difficult to pin down stylistically between his studio’s slotted and hanging chairs. In the same puzzle-piece tradition of the above examples in wood and metal David Graas‘s stool and chair designs take the best possible advantage of the strengths of cardboard to create sturdy furniture that also has a strangely unique style and come in a compact form. 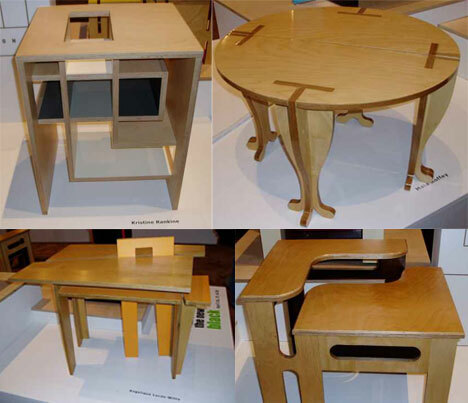 The desFurniture group designs impressively simple pieces of furniture that “push the boundaries of efficiency while maintaining craftsmanship.” Much of their work is created out of a single sheet of plywood and requires no fasteners, adhesives or complex tools. 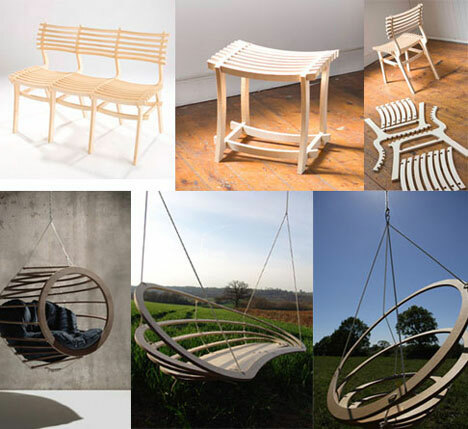 These combine aspects of portable, elegant, simple and ecological furniture design. Shown above are a single-panel lounger, stool, chair and bookcase. 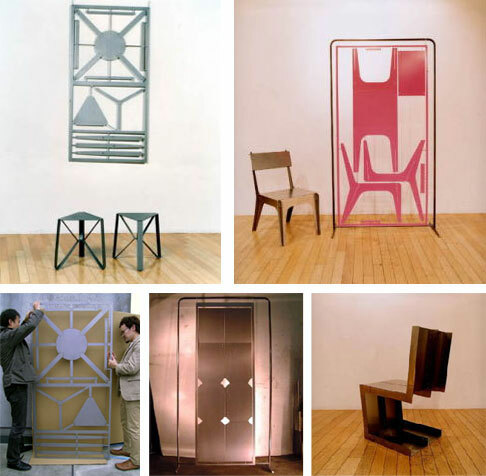 Similar in concept to desFurniture, students of the Ryerson School of Furniture Design created a series of creative furniture pieces each from a single 4×4 foot sheet of plywood. The above desk, laptop stand and tables were each created using this strictly limited amount of material and demonstrate an impressive range of possibilities. 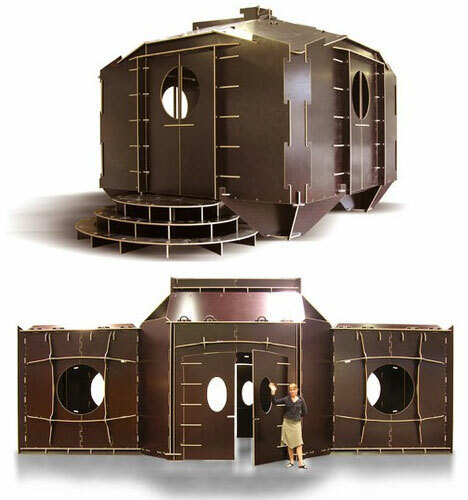 So now that you’ve seen the possibilities of flat-pack design, why not build outsdie the box with a cool flat-pack house? Talk about a great conversation piece! Alternatively, for something more within reach, how about a creative flat-pack book shelf where you flip the supports open and the shelves fall into place? 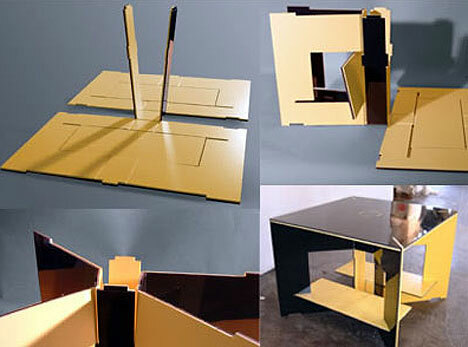 Another possibility for anyone with a saw and a piece of plywood: build your own!